Our group was founded in March 2009 by a couple of friends who were already attending the matches of the BSC Süd 05 for years, but decided to take the support to another level and wanted to be more active for our Sportclub. The Club, which exists since 1905, has a very mixed history. Though it was playing in the first league of the GDR during the season of 1961/62, the Sportclub now is one of the middling teams of the 5th German league. The former fanscene, which partially still exists today, was responsible for the active support of our team till 2009, visiting home and away matches. This support was rather unorganized, so we wanted to advance it and take it further. We started making banners, created first little choreos, established a Capo and began to be present in the townscape and our region via stickers, graffiti and streetart. Something which is not quite common for the 5th German league. Supporting a team in the lower leagues has it’s pros and cons, of course. The football being played is still rough and raw, close to the audience and is not as financially influenced as in the upper leagues. Some of the main letdowns are the lack of away fans and the fact that football in the lower leagues is not very attractive for bigger audiences. But this won’t keep us from being “Maniacs”, a group of friends from all levels of society, old and young, men and women, Antiracist and Antifascist, all united in their love for the BSC Süd 05. 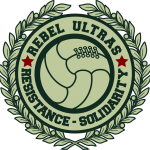 In 2014 we started bonding with the “Upper Class” of the Goslarer Sportclub and “Sektion Nord” of SV Babelsberg 03, another two Antifascist Ultras groups. This alliance is characterized by friendship and great cohesion.